In this example we feature the concept of rewarding customers with the use of assets. Movie stars attend awards and other events in gowns sponsored by designers wearing jewellery created famous jewellery manufacturers. The concept of “something borrowed” has a charm all of it’s own and it is more than a romantic notion for it makes perfectly sound business sense. 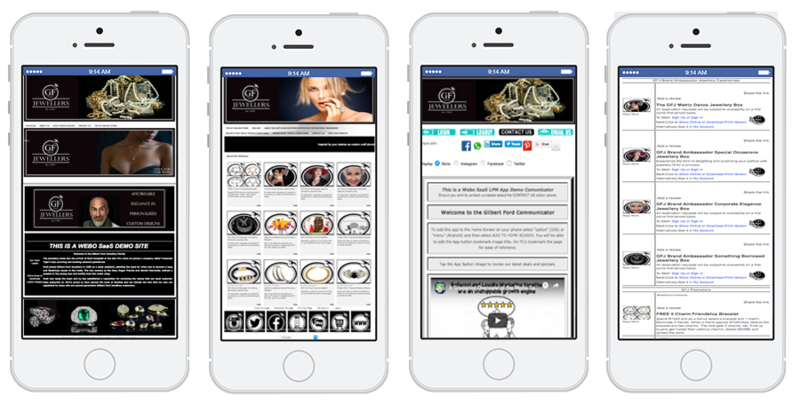 In this example inviting applicants to share the joy of extravagent jewellery will not only be remembered but it will create awareness among girls in their senior years at surrounding schools. In a short few years many of these girls will become engaged and married. The 5 charm friendship bracelet creates a circle of friends who will share in the joy of the indulgences that the friends will share.Voting for a seasonal new release turns customers into advisors who are more likely to buy more often. The #hashtag promotion is opens the door to build upon the relationships that exit. 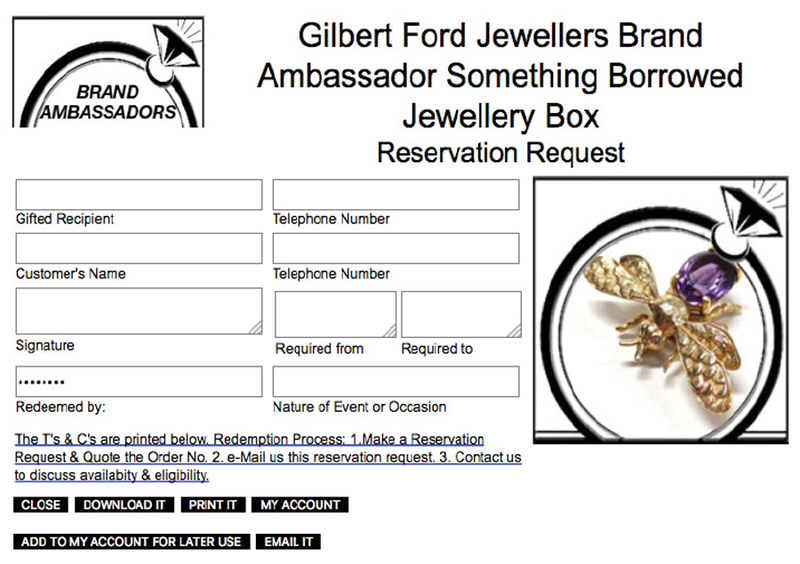 Brand Ambassador Rewards: Defined Jewellery Boxes may be granted to a customer, subject to availability and insurance eligibility, for periods specified by Gilbert Ford Jewellers. Disqualified Participants: Members of the public that are not Gilbert Ford Jewellers customers or people not introduced by qualified customers. Immediate Families: Immediate Families include: Grandparents, Parents, Children, Grandchildren, siblings and spouces whether by marriage, past marriage, remarriage, adoption, co-habitation or other family extension. Limit per customer: One Brand Ambassador award may be awarded to one customer, to a member of their immediate family or to a friend of the customer designated by the customer on a reservation request coupon. Customer Status: Customers are persons who can produce a receipt for a purchase from Gilbert Ford Jewellers. Validity Days: This promotion is valid until withdrawn. Verification: Coupon Validity is subject to verification. Delivery/Collection: Pick-up or delivery arrangements will be specified here. 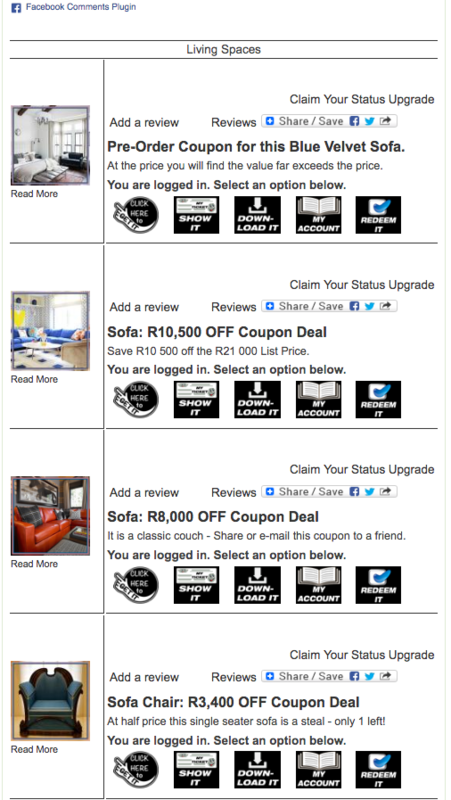 Images: Coupon images are indicative and may not be specifically representative. Service: The Coupon administrator is not responsible for service and item delivery. Amendment: The right to amend these terms and conditions without prior notice is reserved. Let’s say, the Decor Store will publicize their Annual Sale is three weeks time. It will feature end of range furniture at discount prices. So, they offer customers the opportunity to buy these items pre-sale at sale pricing but in addition, customers can invite their friends to share in this opportunity. This communicator makes customers feel special and it opens the door to Refer-A-Friend benefits. Post comments below or you can do so on facebook. Do your customers grow your business? Invest 6.5 minutes on the video and see how to take your customers to Level 3. Ask yourself: How much you spend on getting new customers and then ask yourself if you spend at least a fraction of the amount on customer loyalty and on getting your customers to sing your tune! PS the video transcript is available here. What’s the big deal about customer loyalty? When your customers do your marketing for you by referring their friends and family to you they will grow your business five to twenty-five times more cheaply and effectively than you ever can. If a friend told you a story of success or why they like your products and services are you more likely to accept a coupon from a friend than one found in a newspaper? When you have loyal customers, they won’t switch to your competitors, even when they offer deals as your customers will be comfortable with knowing that they will receive the value that they are accustomed to. Customers return to collect points towards a reward but are unlikely to actively promote your business to others. Customers actively refer your business to their friends and colleagues because you give them something to share and you make it easy to share. Customers engage and advise on what they like and do not like and they will participate in surveys on what they will and will not buy plus on what they would like to become available. To survive and thrive businesses need to build trust, satisfy customer expectations and unlock innovation. Getting your customers on board as team members is an innovation that works. It works because customers know that you are listening, that the dialogue is transparent and that it encourages customer insight on what the value is that you provide. Given these matters customers will participate on your team as they will know that you will take meaningful action that will lead to increased customer satisfaction. Far too many businesses wait for customers to arrive, spend on adverts to attract with cheap deals and have no customer database never mind a communicator app and preferred opt-in database subscriptions to short message alerts, e-mail news or the option to follow and be notified on preferred topics that they have opted-in to follow. Customer loyalty will put you at the forefront because you have an ear to the customer voice on market trends and desires as it is an active form of engagement where customers offer unsolicited feedback to keep your customer satisfaction levels as high as they can be. Industries that use loyalty programmes to acquire new customers referred by existing customers to grow their businesses, retain existing customers and improve their businesses so that they not only survive but thrive. You sent them an invitation to an event? You sent them a coupon? Why do they value your services and what do you offer that makes them come to you vs your competitors? What problems do you solve for them? Is it your location or product functionality, reliability etc. Do you reward social media sharing/referrals and comments plus reviews? On-the-go Coffee and Dessert shops. The baseline self-interest tactic of the printed punch card “ buy 12 get one free” is a start but it leads to frustrations when cards are lost, left at home, etc. It does little to identify VIP customers. Just having a printout of registered customers will help staff to learn their names and personalize service to customers. Offering a coupon to give to a friend will grow your customer base. Offering coupons in exchange for ideas, sharing on social media are an add on to the baseline punch card. Signing up for an online loyalty account. This allows businesses that may not normally maintain a customer database to get to know who their customers are. Adding the App to their phone home screen or bookmarking the page on their PCs. This gives the business a direct “pull” information link to the customer and it should be the start of a relationship. Adding the option to opt-in to messages, email or to follow topics gives customers a wide choice on how they would prefer to be engaged. Participation in campaigns; giveaways, luck draws, volume discounts, feedback surveys, opinion polls, etc. Find the value in the eye of the customer, engage and increase the opportunities for value that will turn transactions into relationships. Most importantly you will open a line of communication that you nurture to be a two-way street! Starbucks runs a very successful loyalty programme. Here are five reasons why. It is personal. 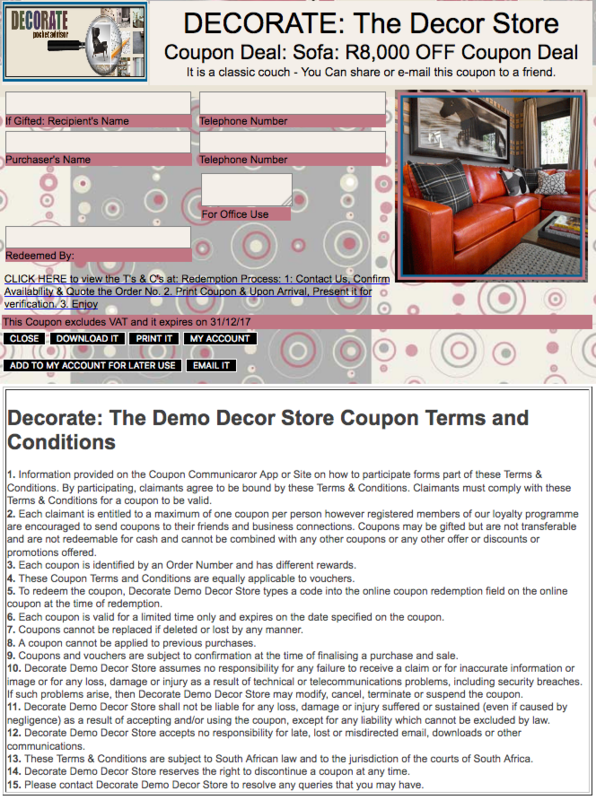 It does not offer printed coupons that get redeemed without them knowing who you are. They run buddy deals. 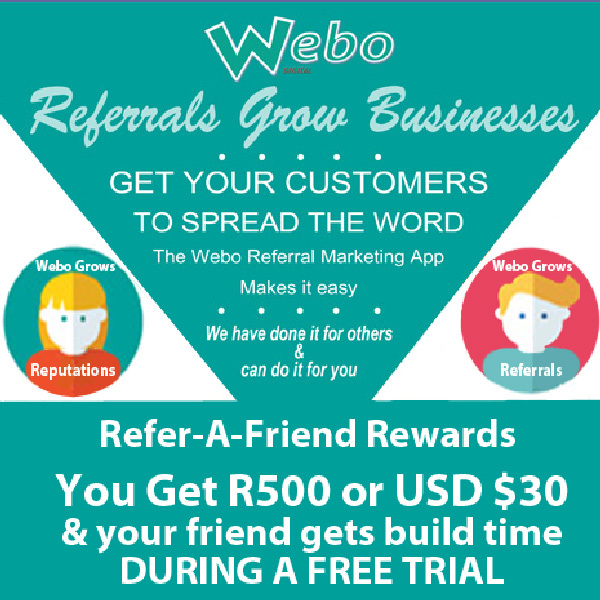 Yip, they partner with companies (non-competitive ones) and they share their database to increase their reach into the community who enjoy the rewards. They promote it. They run awareness campaigns and reward social media sharing. It is online, simple to join, simple to understand and simple to share obvious benefits to friends. Here we have the typical chicken and egg tale of a rags to riches opportunity. Consider a pairing of 3,000 customers willing to share their likes and dislikes with a bunch of buyers eager to satisfy the demand that this community of actively engaged customers is. What we have here is a pairing of data with fashion whether it be clothing, shoes or accessories. Trends and desires are a moving target that only a pairing such as this is able to track and predict the expectations that are to be. Who said you had to feel the fabric and strut the shoe before you buy – the innovation of a user-friendly returns policy, customer rewards, engaged customers that do the feeling and strutting of shoes in the comfort of their own homes is what is giving the online fashion industry the edge that grows on a daily basis. Ask yourself; is it the data, the customer feedback and active advice on moving trends that creates the edge or the box at the door? Get the desires right and personal attention will trump a box at the door any day of the week. You know who the online fashion success stores are but give thought on how it is that you are to compete and thrive with your overheads against the box at the door. It has to be by having a loyal customer base who are engaged and who advise on their desires in a systematic and organized easy to use loyalty programme that works. To work. Retail Clothing shops have to combine an online data gathering strategy via a relationship centric loyalty programme with an off-line strategy that builds in-person connections and relationships. In foreign markets, online fashion is starting to open off-line shops to build the missing customer shopping experience and predictions are that they will buddy up with brick and mortar outlets in the not too distant future. There is a trick to success – I believe it is finding the balance between the power and convenience of the internet and the in-person experience that enables a lasting relationship building opportunity. What is the key to a successful loyalty programme? Let me take a step back. Traditional data analysts work on determining what customers will buy, when, how often and at what price. It is a science of data in and outputs of demand analytics. Loyalty programmes offer an alternative approach. They offer the ability to gather opinions that are the result of thousands of influences that impact desires. The trick is to step away from analyzing the past. The fast-moving world that we live in, is not hindered by historical possibility, but by future opportunity. It hinges on predicting buying behavior based on desires and not on historical data. 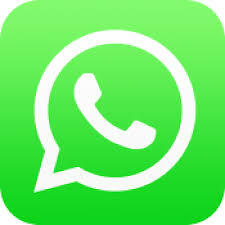 If you are curious about how to get your customers to grow your business please fill in the contact sheet below and we will get in contact with you ASAP.